How many indian restaurants does the main line need? Apparently, there’s no such thing as too many. With the plethora of tiffins and ektas around, here we have a proper sit-down indian restaurants, with tablecloths and everything! 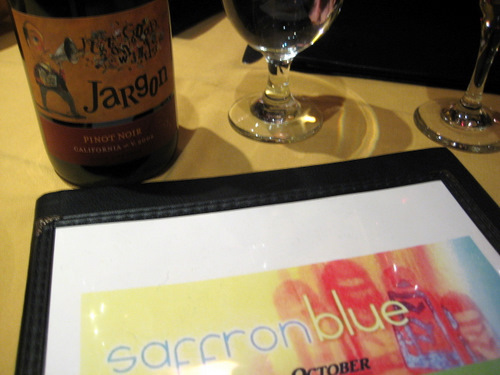 Saffron Indian Kitchen, in Bala Cynwyd, is a BYOB. They’ve got a serious yellow theme going on… could it be because saffron turns things yellow? Well, it’s adorable, warm, and happy. The servers wear bright yellow polo shirts too. And foregoing fancy computerized reservation systems, they use a yellow legal pad instead. You have to admire their old school ways. 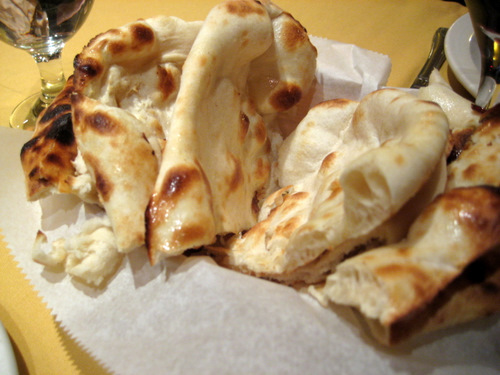 Some hot piping naan. 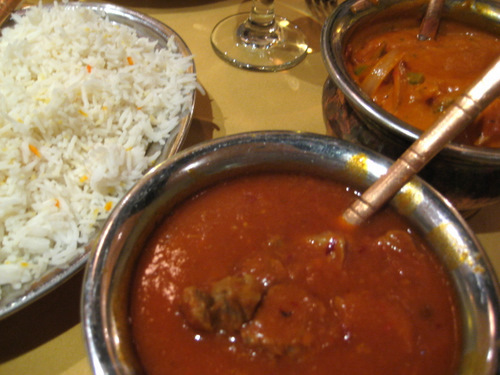 Is there a point to eating indian food without it? To me, I eat indian food because I want to eat naan! J got the kadai paneer makhani, his favorite dish in the entire menu. It is homemade cheese with green bell peppers, onions, tomatoes, and freshly ground spices. I can see why he likes this so much, except for the green peppers. Get rid of them and it would be so much better! I was feeling a little spicy so I got the lamb vindaloo. But you never know what you’re going to get with that stuff. Sometimes it can be freakishly spicy. Not in this case. This vindaloo was only mildly spicy and the lamb was super tender and practically melted in my mouth. Good stuff. 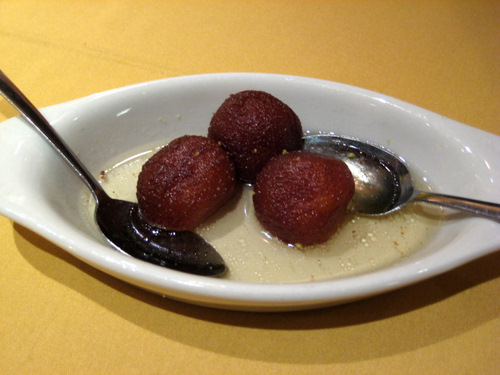 We got the ghulab jamun for dessert. But man, the server really was trying to push the rice pudding on us. Did they have a giant bucket of rice pudding that was just about to turn? Were they going to get a bonus by selling tons of this stuff? In any case, we resisted. I remember having these before at a friend’s house. These are warm dumplings in a sweet rose water syrup. And when they say sweet, they mean it! The service was just fine, if not a bit pushy! There’s even a parking lot in the back, a sweet plus!